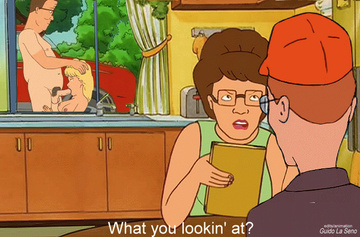 Luanne is the Hill's college-age niece, daughter of Peggy's scheming brother Hoyt and his alcoholic, exhibitionist ex-wife Leanne. Luanne moves in with the Hills after her mother Leanne stabs Hoyt with a fork during a drunken fight which tips over their trailer. 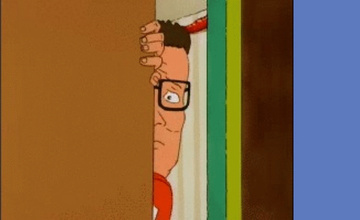 Hank initially makes frequent attempts to encourage Luanne to move out on her own, but later more-or-less accepts her as a member of the family. She was a student at the beauty academy and later at Arlen Community College. She was often portrayed as an airhead, but was shown to be an expert mechanic in the first two seasons and is good at logic puzzles. 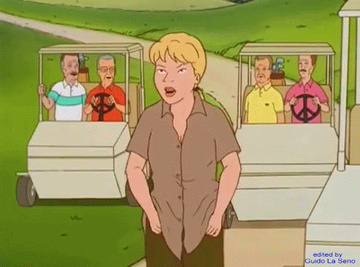 Luanne's basic problem is having been raised by poor parents who had no interest in educating her. Luanne was promiscuous, but she settles down after being visited by the spirit of her first boyfriend, the slacker Buckley, whom she calls "Buckley's angel"; and then attending a church-sponsored "born-again virgin" program and starts a Bible study class. Luanne often is portrayed as having the social skills of a talented ten-year-old, such as when she puts on her "Manger Babies" puppet show for a Public-access television cable TV station. In the 10th season finale, Luanne revealed that she was pregnant with the child of Lucky, whom she married in the 11th season finale. In the 13th Season, she has a baby girl named Gracie Margaret Kleinschmidt, after the family and friends persuaded her and Lucky not to name the baby girl "Lasagna." Prior to being married, her full name was "Luanne Leanne Platter," though the series makes it unclear as to whether she kept her middle name or adopted her former last name as her new middle name after marrying Lucky.